Identification of the Hobo Spider has proven difficult. Professional identification using anatomical characteristics is best; however, Hobo spiders do have some distinguishable qualities that will help to positively identify a spider as the Hobo. The abdomen of the Hobo spider is marked by a chevron (V-shaped) pattern. The “V’s” of the chevron pattern go down the middle of the abdomen, pointing towards the head. Other markings may or may not be found on the sternum of the Hobo spider: a light stripe down the middle or light spots on the sides. 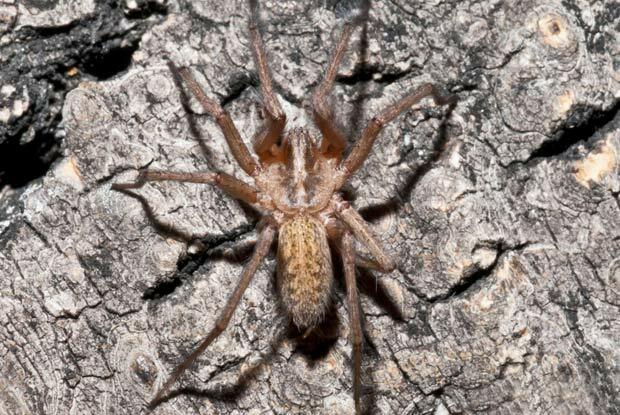 Originally indigenous to Europe, the Hobo Spider is thought to have come to the Pacific Northwest region of the United States in the 1930s (any connection to hobos and the Great Depression is coincidental.) In Europe the Hobo Spider was found mostly in fields and far away from human habitation where its major competitor, the House spider, hogged all the house space. In North America the Hobo’s range has spread throughout the Pacific Northwest and has been reported as far west as Idaho, Wyoming, and Utah. Its nomadic character, however, has proven that the Hobo spider can be successful in various habitats and has the potential to spread into other U.S. territories. The bite of the Hobo spider is venomous; however, the Hobo Spider will only bite a human when under stress, such as being squeezed or smashed against human skin. If a female Hobo spider feels her egg sac is being threatened, she may also attack. Most Hobo spiders do not reside in man-made structures but may come inside in search of a mate. For this reason Hobo spider bites do not typically occur in the home. The bite will cause localized pain and swelling and can cause necrosis (tissue death). Hobo spider bites have not been known to be fatal. In fact, about half of Hobo spider bites do not inject venom and therefore display no symptoms, but lesions caused by its bite can take months to heal and begin as a small red bump. The bump may begin to blister and scab over between 24 and 36 hours after the bite, then “oozes” as it heals. Systemic symptoms of the Hobo bite include headaches, obstruction of vision, vomiting, and a feeling of discomfort or uneasiness.